The patient’s back pain was a mystery. The sharp, shooting pain came on suddenly in the middle of the day. She hadn’t been carrying anything heavy or made any unusual movements. The pain subsided within a few hours after some basic stretches. Then, a few days later, it happened again. 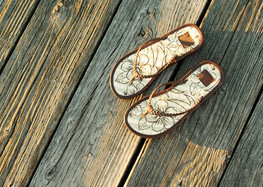 This time, the patient realized she had been wearing the same shoes both days – flat sandals with no arch support. That could very well have been the cause of the pain, said Ella Health Physical Therapist Jane Quach. “Generally, women aren’t surprised to learn that high heels can cause pains, but they don’t expect it from flat shoes. And yet, those cute summer sandals can be really be troublesome,” said Ella Health Physical Therapist Jane Quach. Everything is connected, and areas of the body including knees, hips and back can be affected as much as your feet by the shoes you wear. That means knee pain, hip pain and back pain could be related to your footwear. Wearing flip flops or flat sandals can cause you to roll your foot in (pronate) causing increased stress on your foot, ankle, knee, hip and back. Wearing high heels puts extra pressure on the balls of your feet and shortens your calf. Shoes with pointy toes or narrow toe boxes can squish your toe into an unnatural position. Prolonged wear in this style puts stress on your foot joints and can result in blisters, corns and bunions. But it’s not just flats or heels that can cause problems. Worn out shoes won’t give you proper support either, which can put your body out of alignment when you’re walking or just standing. That can also cause knee, hip or back pains. Take a look at the bottom of your shoe. If there are no longer lines where there used to be or if one side of your heel is significantly lower than the other, it may be time to go shoe shopping. What shoes are good for us? Generally, you need a certain level of foot support in order to maintain proper body alignment. The best shoes for you fit properly, have sufficient arch support and provide wide enough toe boxes. Depending on your activity, you may want a shoe that also offers extra support and cushioning. Your physical therapist may be able to refer you to a store where you can get a gait analysis and an evaluation of your fit in order to identify the best shoe. You don’t need to give up on fun sandals entirely. Even Jane admits to loving her cute shoes. But, she said, it’s best to primarily wear comfortable shoes with good support based on your individual foot and ankle requirements. If you experience a sudden, sharp pain, don’t ignore the message your body is sending you. Try resting, icing, stretching and a change in footwear. And if the pain persists, see a physical therapist or your doctor. It can be helpful to keep a log of the intensity of pain and what activities seem to make it better or worse. Thanks for the advice, I had no idea that sandals can be so troublesome, especially when worn for a long time. Thanks for the advice on flat shoes because it shows that such things should be worn carefully.